The Scene is Nicanors Pallace. Tryphon Demetrius Stratonice and Irene. Demetrius from behind Tryphon fixes his Eyes on Stratonice, folds his Armes the one Within the other, Sighs and goes out still gazing on her. This is the tableau mentioned above, but if it is a shutter discovery, as the direction indicates, there must be another setting, a relieve, representing the same fictional location. We might postulate that the ‘scene opens’ merely states that the act begins – a variant of the opening stage direction in The Play-House to be Let – and that the actors should enter in dumb show. However, there are two manuscript copies of the play in the Bodleian Library, and one (Ms. Malone 11) clarifies the published direction. Following the scene heading the direction reads: “The Scene opens where is discover’d Triphon…”. 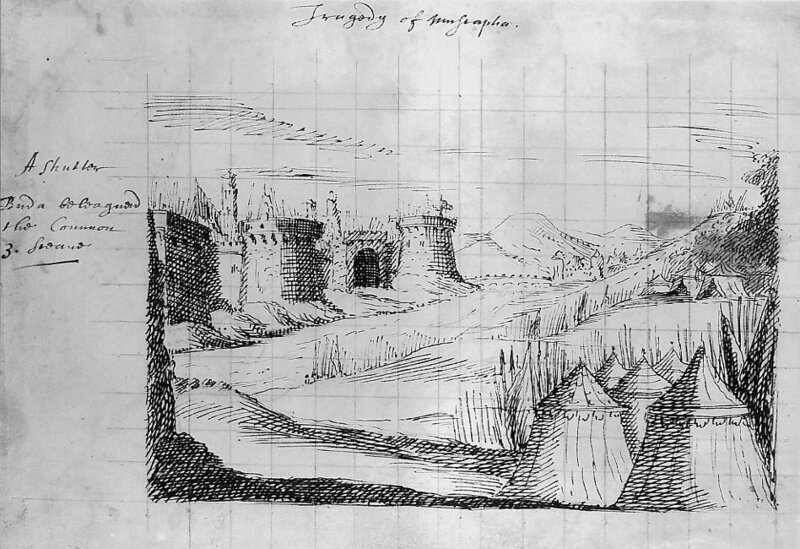 As Nicanor’s palace is already in view the new scene must, therefore, be a relieve representing the same location: the inverse of the one-scene-for-two-places use we have observed elsewhere. There is no need for the wings to change of course. For the garden scene 2.3, the shutters representing Nicanor’s Palace withdraw to reveal a grove of trees, while simultaneously the palace wings are changed for those of the garden, last seen in 2.1. We may infer from its position between two relieve scenes in Act 5 that the garden setting must be a shutter scene, but there is also supporting evidence. 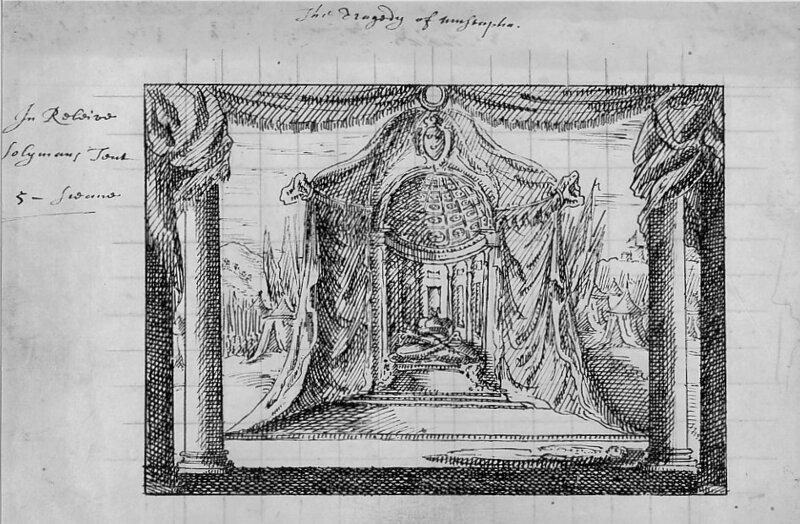 The printed text of Boyle’s Guzman, which includes promptbook annotation, adds “The garden in Tryphon as a Back Scene” to the 4.6 scene heading “The Scene a Garden”. There are two other matters of note in Act 5. 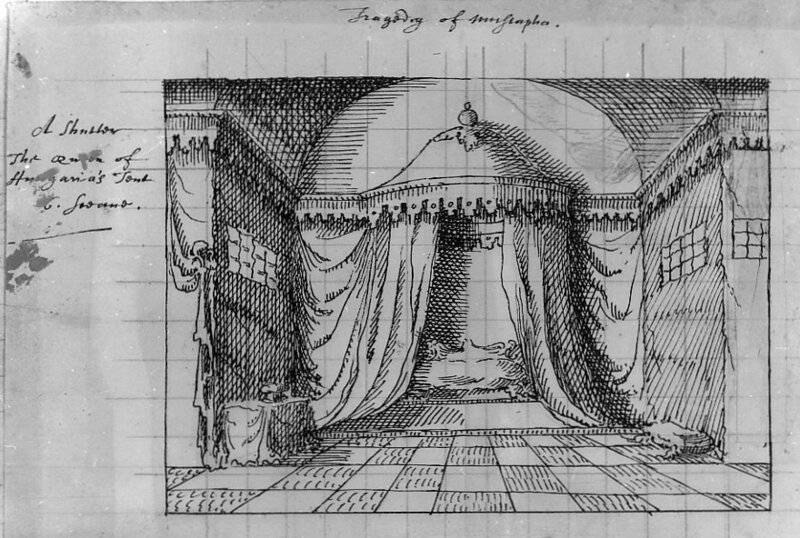 A stage direction in the last scene set in Tryphon’s Palace seems to indicate that the actor should retire into the relieve area: “Tryphon goes to an elevated place like a Throne, seats himself in it, then draws a Ponyard…”. After a speech Tryphon stabs himself, then his faithful servant Arcas “runs to Tryphon, takes the Bloody Poniard which lay by him, and with it stabs himself”, and, “He fals dead at Tryphons feet”. This is essentially a repeat of the Mustapha/Zanger suicides in Mustapha. In that play, however, the bodies are carefully positioned in the relieve area, here that is unlikely. If Boyle had intended the deaths to take place behind the shutter line he could have removed the bodies from sight simply by directing that a shutter should close at that point. Instead, after everyone on stage has followed the direction “They all goe towards the dead Body” (of Tryphon), Stratonice asks the Captain of the Guards, “Sir, let his Body be from hence convey’d”, a request that would be redundant if the corpses could be hidden by the shutters. Thanks to Dryden’s witty epilogue to Tyrannick Love, written for Nell Gwyn, we know that ‘dead’ bodies in Restoration tragedies could be removed by employing bearers to carry them off, and that might have been the case in the original LIF production. However, an additional stage direction in both Bodleian MSS suggests another solution: “A Curtaine is drawne afore the dead bodyes”. This is an interesting piece of evidence in the light of my suggestions elsewhere for the use of a traverse curtain in other LIF productions. Although, we do not know whether such a method was used in production, it was clearly considered a potential solution at the time, most probably by Boyle if the source text for these MSS is authorial, as W. S. Clark believes. The concern to minimise wing changes indicated by Boyle’s 2.3 heading, and implied by the use of two different backscenes (but not wing settings) to represent Nicanor’s Palace, adds weight to the hypothesis that the LIF scenic system had only three wing grooves at each position. Conservatism regarding wing groove replacements is inevitable given the wholly manual system of scenery changes employed in England at this date. It is for this reason that I believe a maximal scenic production is contraindicated. 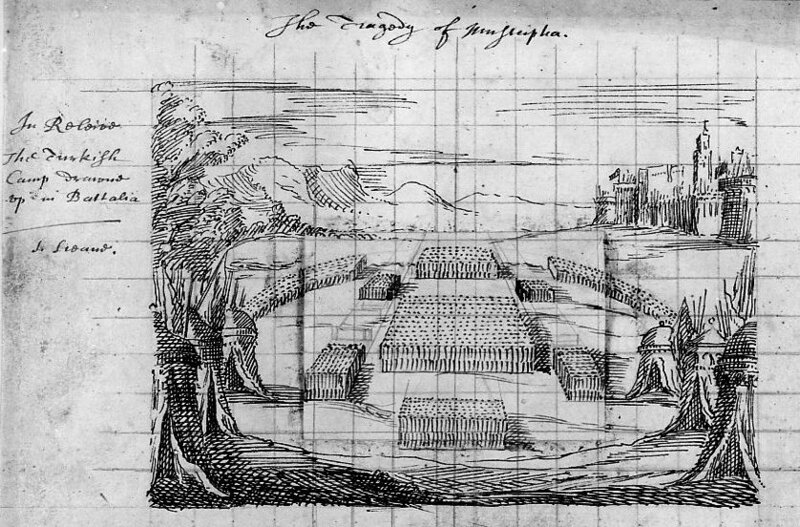 Although such a production would call for only seven separate settings, it would necessitate awkward wing and shutter groove replacements in Acts 3 and 4, as can be seen in the scenery plot. A fully minimal production might differentiate between categories of interior scenes rather than between the fictional owners of the rooms. This was probably the case for She Would If She Could. In such an arrangement ‘palace’ and ‘apartment’ shutters would serve all scenes where those interiors were required. Using one apartment shutter scene makes sense as ‘Demetrius’s apartment’ is specified only once, but allowing separate shutters for the two palaces would aid clarity. A diegetic reading of the text would allow different wing settings for the garden and the ‘obscure grove’, but shared wings are probably the best theatrical interpretation of the scene headings. As with Nicanor’s palace, differentiation is provided by the contrast between shutter and relieve settings. These compromises eliminate awkward groove shuffling – only one mid-act replacement is required – but maintains the differentiation and novelty expected of a socially significant production by an aristocratic author. My italics. See, Clark, Dramatic Works, p.886. Guzman, London: Francis Saunders, 1693, p.37. 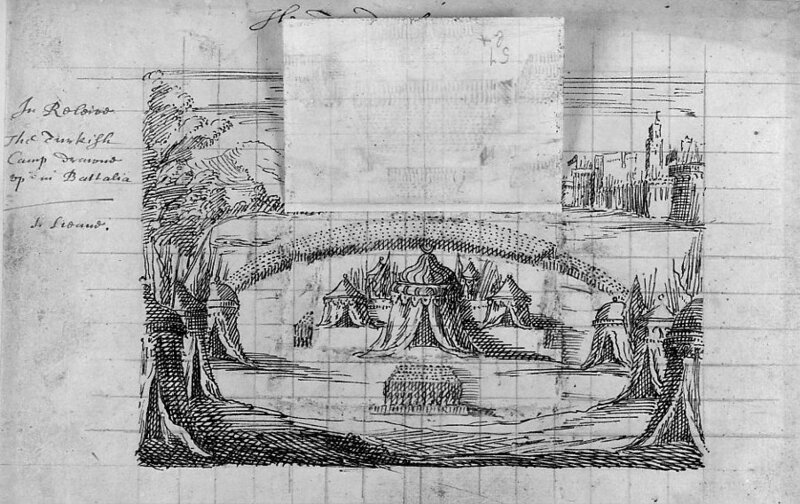 For 17th century use of ‘backscene’ see Timothy Keenan, Thesis, London, p.4, n.9, and Lewcock, Thesis, op cit pp.95-6. “Epilogue Spoken by Mrs. Ellen, when she was to be/ carried off dead by the Bearers” (London: Herringman, 1670). Mal. 11 & Ms. Rawl. poet. 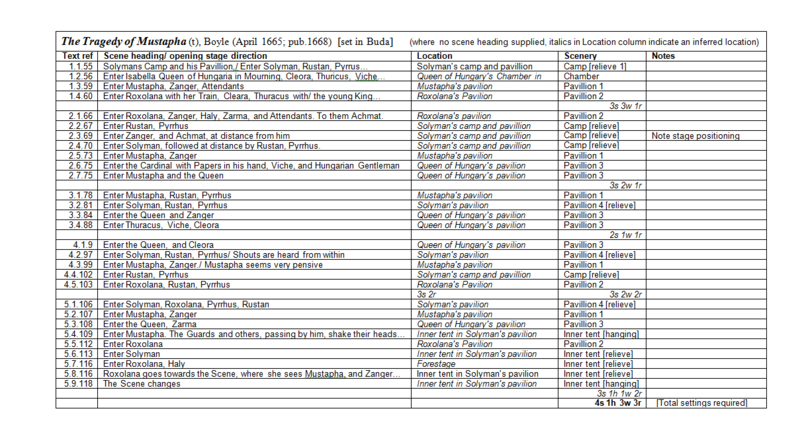 39 substitutes, “…before Tryphon & Arcas” (Clark, Dramatic Works, op cit p.890).